Our lovely neighbours have come back from a trip to Hong Kong and brought us a present; Loretta Roberts’ Sketches of Sai Kung, a gorgeous, evocative patchwork of beautiful details of the area from Clearwater Bay to the Country Parks. 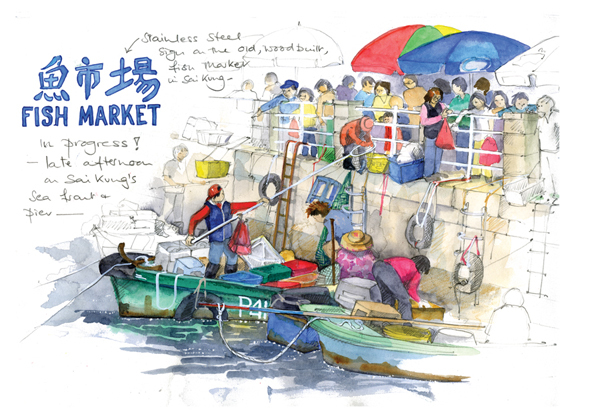 It’s one of a series Ms Roberts has produced capturing areas of Hong Kong, and on the evidence of this one I hope she carries on indefinitely to turn her painterly eye on the whole of the People’s Republic. While I wait, I can at least travel through China, past and present, by my favourite method of transport – books. I have a suspicion that present-day China is not much like the world of Missee Lee, Arthur Ransome’s most dashing adventure and a very long way indeed from the Lakes and the Broads (note to American readers: the Broads are an area of eastern England and not whatever else you may have thought). Modern China may have lost something of the swash-buckling and whatever-the-Mandarin-for-chutzpah-is that defines the formidable Tycoon Miss Lee, but – and I’m not sure Ransome saw this one coming – her desire to set up a facsimile English public school in China has come true, and Eton, Harrow and all the rest are jostling each other in their rush for yuan. Read Missee Lee and learn how to be part of a ceremonial dragon and how to sail a junk; you never know when such skills might come in useful. Young people today are more likely to be reading Adeline Jen Mah’s Chinese Cinderella . Try not to be put off by the fact that it quite often appears on set-text lists. Read for interest and pleasure, this autobiographical account of life in a pre-Maoist China is affecting and vivid. It makes a good companion for Emily Prager’s A Visit from the Footbinder. Every now and then, it is worth reminding ourselves of the sheer inventive outlandishness of the things we have managed to come up with to inflict misery on our fellow human beings. At present, the fear and loathing of women expresses itself in the unforgivably barbaric practice of female genital mutilation. Remembering that the mutilation of the female foot seems to have passed into history might give us strength to believe that this too will pass. ‘Culture’, in the anthropological sense, is too often used as a shield for being horrible to other people. A study of cultural history reminds us that nothing human is fixed and for ever. The challenge is to find ways of speeding up the glacial pace of cultural change towards (oh yes, don’t forget that I am at heart a soggy liberal humanist) humanity’s natural desire to be nicer to each other. It was fashionable when I was very young, along with the obligatory poster of Che Guevara (even then we were shallow enough to prefer our heroes to be good-looking and, at least at the angle caught by that iconic image, he was), to have a copy of Mao’s Little Red Book somewhere on the bookshelf. As small as a prayer-book, and encased in tacky soft red plastic, Quotations from Chairman Mao Tse-Tung (we hadn’t revised our phonetic opinion to Zedong in those days), was, I strongly suspect, more owned – oh the irony – than read, and a little dip into it now does not make me regret all those years of Not Reading Mao. Like all despots and dictators, he comes across in what purport to be his own words as a pompous prig as well, of course, as a man who seems not to given a hoot about causing the death of millions of people – about forty-five million people, in his case, making Stalin look like an amateur. ‘Let me have men about me that are fat,’ Shakespeare has Julius Caesar say, claiming that the men with ‘a lean and hungry look’ are the dangerous ones. Goebbels, Assad and Putin might suggest that Shakespeare was on to something, but the sad truth is that the chubby boys – Stalin, Goering, Mao – use their avuncular looks to cloak their disgusting addiction to cruelty as well. The problem lies deeper than the flesh, however much or little there is of it. 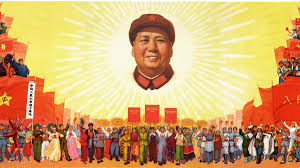 Now that Xi Jinping has re-issued Mao’s book in China and seems, depressingly if unsurprisingly, to be recycling some of his – and I use the word loosely – ideas, it might be sensible to read Mao: The Unknown Story by Jung Chang and Jon Halliday, a meticulously researched (and, in Jung Chang’s case, experienced) account of the vileness of his regime. You may well have read Jung Chang’s Wild Swans, but if you happen not to have done so yet, do: it is her haunting evocation of the lives of three generations of women in her own family, from her grandmother to herself. And read Soul Mountain, the novel by Nobel-prize-winning Chinese author Gao Xingjian. Mysterious, structurally complex, allusive and elusive, the book feels like a pretty good metaphor for China itself. In 2010, the Nobel Peace Prize was awarded to Liu Xiaobo. He has not yet been able to collect his prize because the Chinese authorities had already thrown him into prison for ‘inciting subversion of state power’. He has been sentenced to eleven years’ incarceration. So, next time you buy something with Made in China stamped on it, remember that you are doing your little bit to support a particularly foul regime. Use your money instead to buy a copy of Liu’s No Enemies, No Hatred. Now there’s a manifesto promise worth making.